To go directly to the online reservation form, please click here. 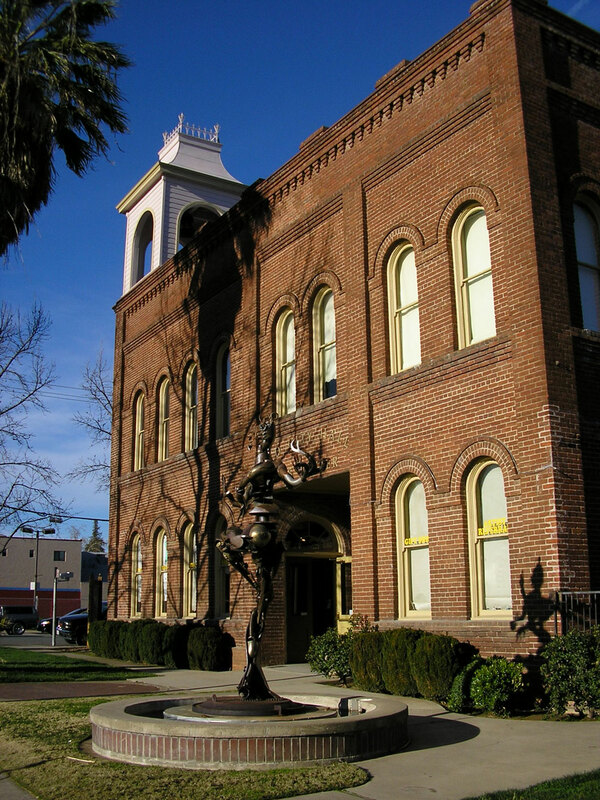 For classes, download the class proposal form here, and return it to Old City Hall, 1313 Market Street, Redding, CA 96001 or fax it to 530-225-4455. For general information, capacity, fees, insurance requirements, and regulations, please see below. The hall also has camera capture capability. We can mix live performances and, if necessary, edit them. Therefore, any event can be captured and turned into a DVD. 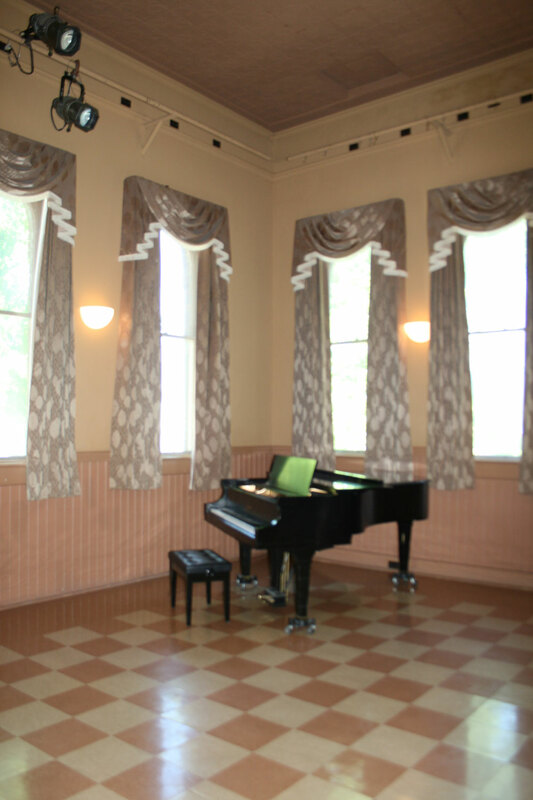 The hall has a sound system that can accommodate up to sixteen instruments or vocals with plenty of power. A projector for playing movies or PowerPoint presentations is available. The performance hall has old-fashioned ambiance from being restored to its original City Hall days. Its options of modern technology make the space a very nice venue to present your event. 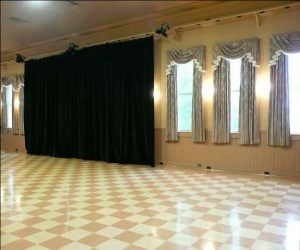 We can host plays, bands, business meetings, movies, television productions—any event you can think of. 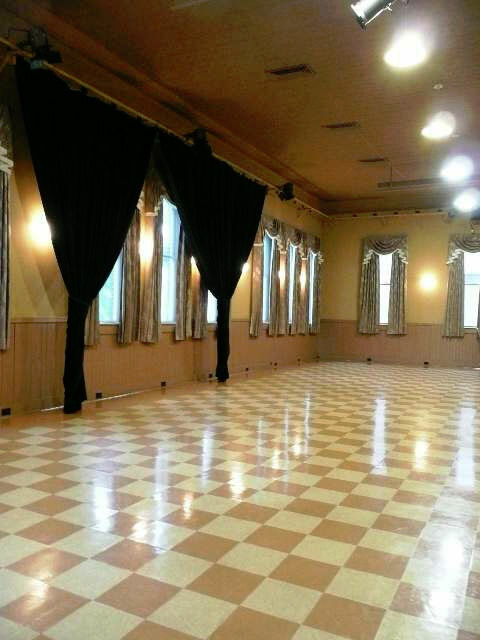 There is also a set of black curtains that can envelope three-fourths of the hall perimeter. We can also provide seating for up to 130 guests. To go straight to the online reservation form, please click here. Piano Tuning The Yamaha piano is tuned approximately once a month. An additional tuning is $120. Pay this directly to the tuner designated by SCAC. Please make arrangements with Bill Bogenreif by calling 530.547.5694. The rental fee must be paid in full 10 days prior to the event. If the rental is canceled in less than 30 days from the scheduled event, $100 is retained to cover administrative fees. Full Liquor Liability: $1,000,000 per occurrence for bodily injury, personal injury, and property damage. General Liability: $1,000,000 per occurrence for bodily injury, personal injury, and property damage. The City of Redding and the Shasta County Arts Council, its officers, officials, employees, and volunteers must be included as additional insured. The certificate of insurance is needed 10 days prior to the event. If it is not provided at this time, the event will be canceled and $100 of the deposit is retained. Homeowners: The easiest, most convenient, and cheapest way to obtain insurance is through a homeowners policy. Contact your insurance broker to obtain a policy. H.U.B. : www.eventinsure.com. This is online only and will require someone who knows how to use a computer and the internet. Follow the instructions on the web page. Other than homeowners insurance, this will most likely be the cheapest policy. S.F.I. Insurance: Contact Joe Gibson at 1322 Butte Street, Redding, CA 96001, or at 530-244-7446. InterWest Insurance Services: Contact them at 310 Hemsted Drive, Redding, CA 96002, or at 530-222-1737. All food and beverage concession sales during intermissions and for events held in the facility will be held by SCAC (unless specified otherwise). The proceeds will be retained by SCAC. The facility manager shall be present during all hours of facility use unless other arrangements have been made and are noted on the contract. The manager oversees the safety of the public, the coordination of the event, operation of all SCAC equipment, and cleanup of the facility. The use of nails, screws, etc., on walls, tables, or other equipment is not permitted. Tape, if used, must be carefully removed immediately following the event. The user will be responsible for any damage to the facility and must leave the facility in the same condition it was found, including areas outside the building. Users shall observe, obey, and comply with all applicable city, county, state, and federal laws. Approval for use will not be granted to persons less than 21 years of age. SCAC reserves the right to cancel or preempt classes up to 10 days prior to the event. One person from the event shall be designated as the liaison to SCAC and will assume all responsibility for communication, etc. The user is responsible for the setup and cleanup of the event. Setup and cleanup times must be included in the use time. Appropriate fees will be charged. The user is to leave the facility in the same condition as it was found upon entering the facility. The user is responsible for its own merchandising. No percentage will be required. Use of the facility is for the expressed purposes stated in the application. No changes may be made without reapplying or without approval of the facility director.